You’ve heard me say it before: you’ve gotta plan for health or it won’t happen. That means workouts are on the calendar, and meals and snacks are on your meal planner. Admittedly, I sometimes falter on the latter. So while I’m know I’m boxing this lifting weights on Thursday morning, I still have no idea what I’m making for dinner on Thursday night (and I’ll inevitably be thinking about it while at the gym). I do stock a healthy kitchen and make it easier on myself with a little Sunday food prep. It not only takes some of the guesswork out of “what’s for dinner?” but also saves what seems like hours in the kitchen later. Say I already have some cooked quinoa and a batch of beans along with several washed and cut-up veggies and toasted nuts in the fridge. I’ve got my healthy bases pretty much covered and can go in a variety of directions. I may make quinoa burgers and roast the veggies and mix with nuts; or I’ll toss the veggies and quinoa in the wok for a healthy take on veggie fried rice; I may blend the beans into a soup and serve with a hearty salad. Keeping healthy food visible (I store in clear glass containers), easily accessible, ready, and pretty (yes, pretty – it helps) makes the healthy choice not only the easy choice, but the only choice. Think of it as the mise en place for healthy cooking at home. The goal of advanced food prep is to reduce your stress level not add to it, so prep a few of the following items ahead of time if you can or one if that’s all you can do, and thank yourself later. There is no right or wrong to getting a head start on the week. Also, if you aren’t up for it on Sunday, who’s to say you can’t prep on Tuesday? Tip: to make the process feel less laborious, I turn on some music, and ask Sean to open some wine. 1) Wash/chop/prep veggies and fruit: To ensure vegetables are fronts and center at the dinner table and not an afterthought, prepping early is a must. I’ll try to have large batches of at least 4-5 vegetables ready to go for the week (we typically have two vegetables on the same night or a cooked veg and green salad). Carrots: I will peel and cut into sticks for easy snacking (with hummus, of course) or roasting and steaming, but simply peeled whole carrots are also great for kids. I passed along this tip to my brother and his 4 and 7 year-old love snacking on whole carrots, mess free. Brussels sprouts: As much as I love Brussels sprouts, trimming the stems and peeling the outer leaves can be very time-consuming while making dinner, so I definitely try to do this ahead of time. With the music on loudly. Later in the week, I’ll make my family’s favorite Brussels sprouts recipe. Butternut squash: If cubed butternut squash isn’t ready ahead of time, chances are I’m not prepping it before dinner on Tuesday. 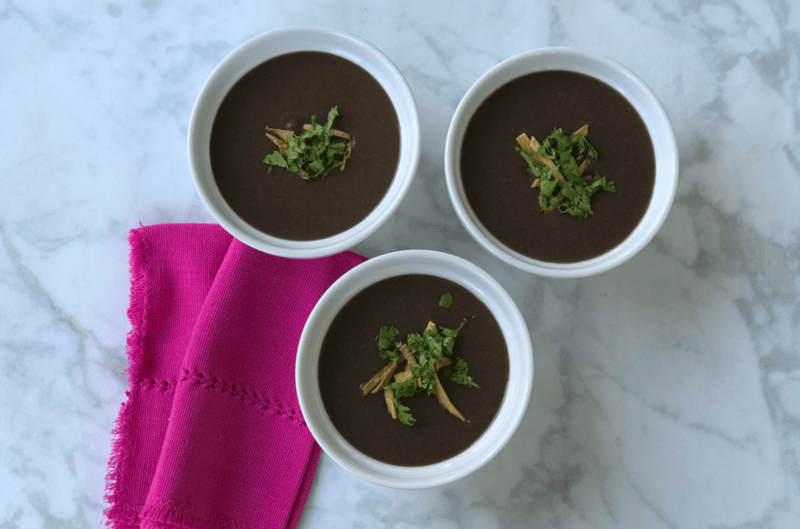 We love this tossed with coconut oil, cayenne and salt and roasted or in our favorite tacos but it’s also delicious blended into a soup (roast with shallots and a little ginger then blend with chicken or vegetable broth). We pretty much eat butternut squash all winter long. Broccoli/cauliflower: I cut these into florets but do try to use in the next couple of days because broccoli can be/get smelly. This is one veggie I love when it’s simply steamed, but I also use it for stir-fries or roasting with plenty of garlic slivers. 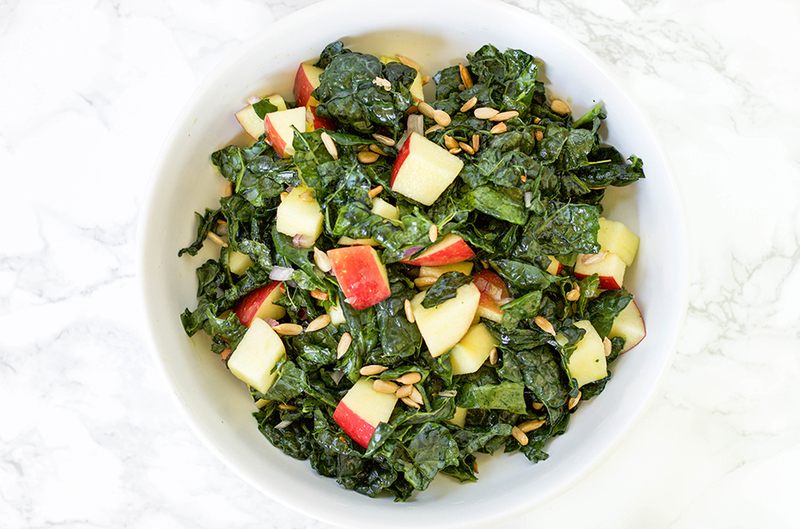 Kale: I buy pre-washed spinach, arugula and baby kale, but to make my favorite salad in a snap, I’ll rip the leaves off of lacinato/Tuscan/Dino kale and have them ready to massage. I also love kale ribbons in grain salads or mixed in a rice dish. Green beans: Wash. Trim the ends. Bingo. Beets: So messy, yet so delicious, I may roast a big batch on Sunday and serve a couple of times that week. 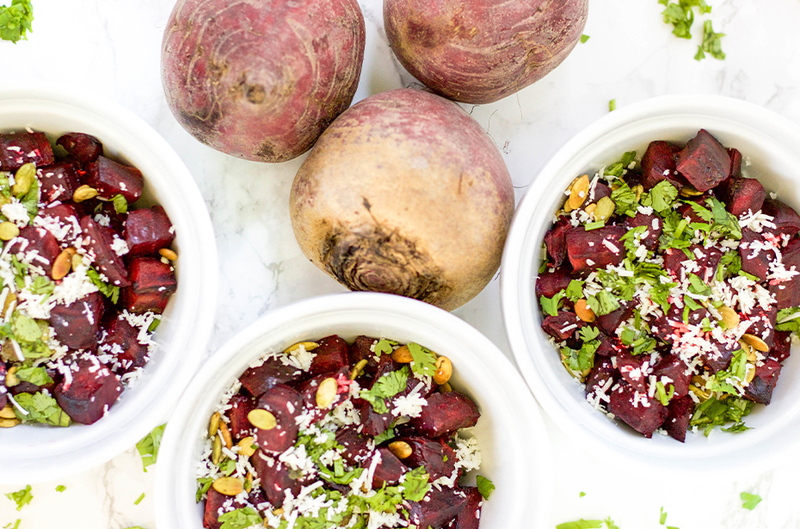 Try my sweet and spicy beet salad. Mushrooms: Clean with a wet paper towel and store in a paper sack. Japanese yams: Clean and cube and roast with a little miso on Wednesday. Garlic: Peeling a dozen cloves of garlic ahead of time saves my sanity and my hands from smelling all week long. Pomegranate: Seeding the pom on Sundays makes for a colorful week. I love pomegranate seeds in all kinds of salads, like Andy’s kale salad but also love them with quinoa and other grain salads. whether they’re leafy greens or grain based. Tonight: pomegranate and green onion in a quinoa/millet/bulgur blend. 2) Toast nuts: Toasting nuts will change your life, or at the very least, your cooking. Toasting brings out the flavor of nuts and improves the texture. And because you can store nuts for up to a year in the refrigerator, you only have to do it every once in a while. 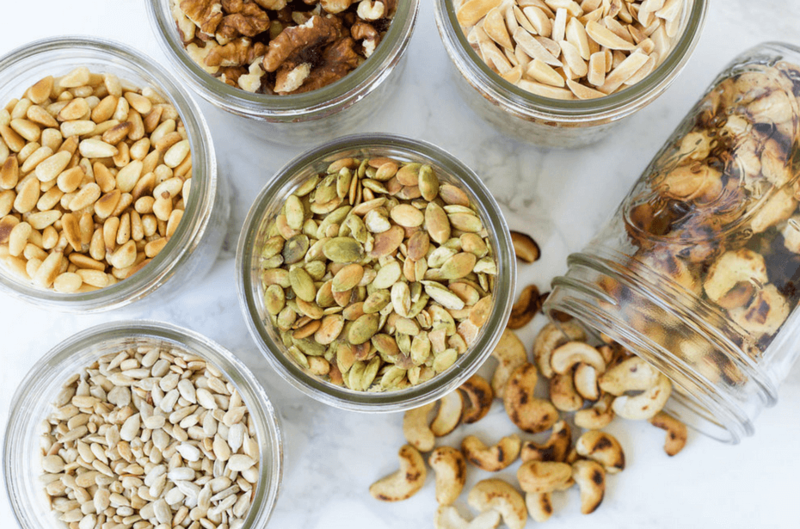 I’ll toast an entire bag of pine nuts, cashews, sunflower seeds, almonds or walnuts then use them with everything from breakfast to salads and stir-fries. Also great for a quick post-workout snack. Toast in the oven at 350 degrees for 5-10 minutes until they begin to get golden-brown or on the stove-top (but pay attention; I’ve burned my fair share of nuts when I’m not paying attention). Store in airtight, moisture-free glass jars or containers. 3) Grains and seeds: I like to vary grains, so one week, I’ll prep a big batch of quinoa, and the next it may be bulgur or farro. In any case, the ease of having a cooked whole grain ready to eat cannot be overstated. Mix grains with yogurt, fruits and nuts for breakfast, mix with beans and veggies and nuts for a room temp salad at the office, and for dinner, quickly sauté with cooked veggies for a stir-fry or mix with cherry tomatoes, green onion and avocado for a tasty side dish. 4) Beans: As one of our go-to plant proteins, fiber and iron-rich beans are a must in our kitchen. While canned beans can be a busy parent’s best friend, there’s nothing like the smell of homemade beans simmering on the stovetop on a Sunday afternoon. I’ll soak black or pinto beans on Saturday night, then begin to simmer on Sunday morning. The prep work takes minutes: simply drain soaked beans, rinse in cool water, and place in a stockpot or Dutch oven with enough water to cover the beans by one inch; add 1/2 an onion, a few cloves of crushed garlic, and a bay leaf, and bring to a boil; reduce to simmer and with lid slightly tilted, cook until tender, about 4-5 hours; add salt about 30 minutes before the beans are done. I may use the beans later that week for a delicious soup, to serve in grain salads, on tacos or tostadas, and for my ultimate comfort food, over brown rice. 5) Flavored waters/ice: We go through our citrus and herb-infused water like well, water. I always keep a large jug of refreshing water with lemon and mint from the garden or orange slices and basil. I also like fruit and herb-infused ice cubes for my iced green tea. 6) Homemade dressing: I can’t remember the last time I bought bottled salad dressing, and once you have a few recipes in the rotation, it’s likely you have, too. 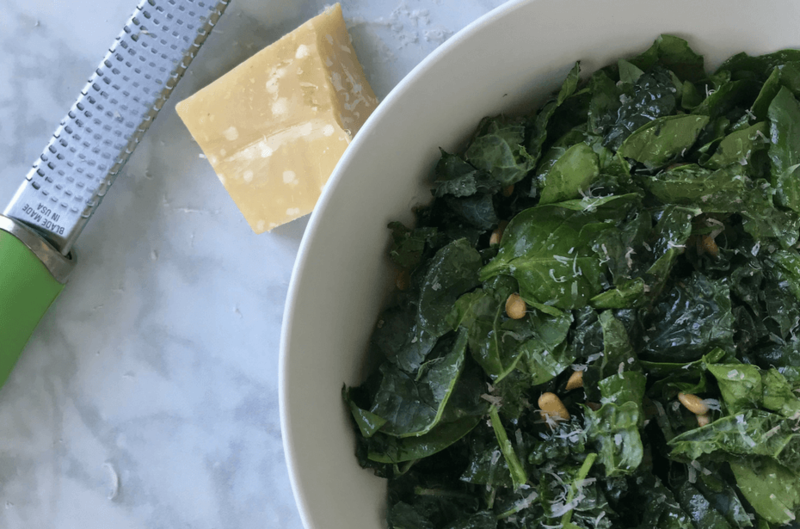 I love a simple mix of lemon and olive oil with Himalayan salt, like the one I use in this simple, everyday green salad, but mixing it up is also fun. 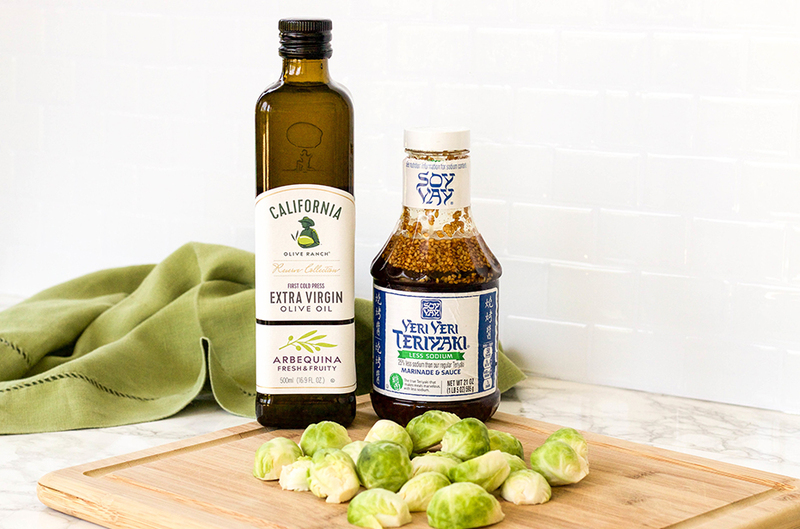 Try the delicious basil vinaigrette from my chickpea salad on your favorite mix. Happy, healthy week! Do you have any food prep ideas you’d like to share? I’d love to hear from you.